In this article I show how a custom launcher could be created for RPG Maker, with a very simple DRM implementation that forces users to use your launcher. DRM Some game executables do not run unless it is launched by the launcher, for example. The launcher executes the game application with some command-line arguments The launcher doesn’t actually have to wait; if you want to have your launcher do something in the background, however, that might be useful. What this does is check if you have the string “CUSTOM_LAUNCHER” in the arguments, and if it is not there, then it will inform the user why the game does not work and then close the game. In this case, it simply tells the user to use the game launcher. You can download a demo version of my game launcher project here. Simply unpack it and try to run Game.exe, and then run the launcher. You will need to have Java installed on your system but it usually is. I have discussed how a game launcher can be written, and how command-line arguments can be passed to the game via the launcher, and finally how those arguments can be used by the game. I have also shown how you can require your game launcher to be used to start your game, and consequently apply DRM to the launcher itself (rather than the game). Now you should have all of the things necessary to build your own beautiful game launchers. What do I save the file as when I put the code in Notepad++?? I have it saved as a .java but says that the app cant run on this device but the demo version is A-Okay. And same for the DRM please. 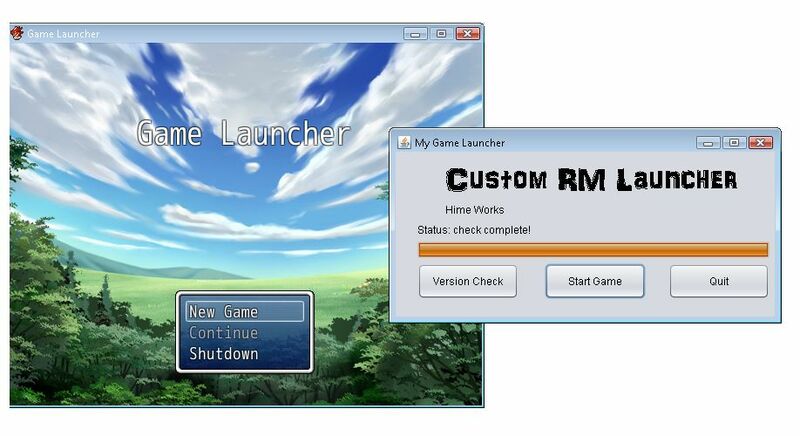 This is just a proof of concept on how to launch RPG Maker with a custom launcher written as an external application. If you want to check for updates and download them you would need to write the code to perform HTTP requests to an API and then depending on the response, proceed with the download and update process. The demo link is dead. Could you repost it please? I’m really trying to get this kind of thing to work for my game. Question: Does this prevent people from simply replacing the Game.exe with their own Game.exe? Do you know a way to prevent that too? Nm, I see that that is what the ARGS thing is for. I’m having a little trouble with it, but I’ll figure it out. Wait, just realized this is for Ace. Would it work for VX? This is for Ace. It might work for VX, I don’t know. Is it possible to have an .exe version of this instead of of a jar. file? It is just an example that I used with Java. You could write one that produces native windows executables as well, or package the jar as an exe, or something else. Sadly I have no real knowledge in programming such things, but thank you for your answer. Would you be interested in working with me on .exe version of this? Of course paid? Do you have an idea in mind on how it should look or function? The same like your jar. launcher but only as exe. Like your jar. but only as exe.